Make Way for the Super Squad! Oh, and the Justice Society, too! 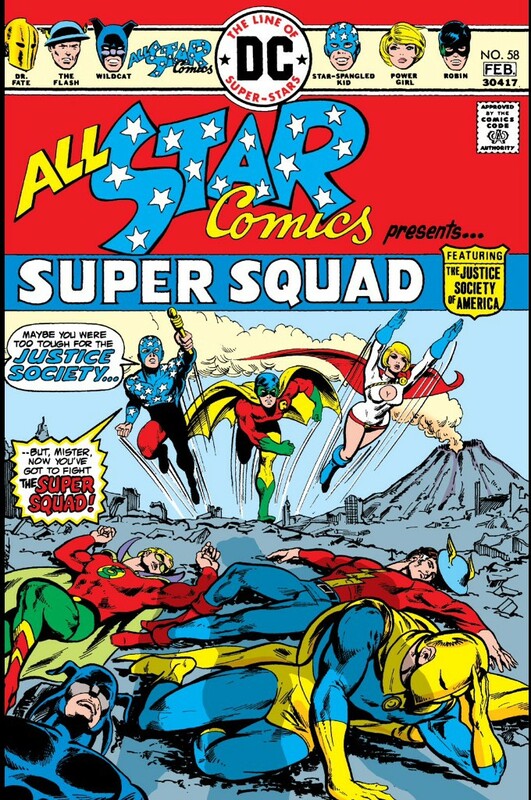 The return of All Star Comics – and the Justice Society! Super-hero team names are tough. Have you ever tried coming up with one? And, of course, the first and greatest of them all, the Justice Society of America. So when DC decided to revive the Justice Society in its own book – really, a continuation of its original home, “All Star Comics,” The Powers That Be apparently felt that “Justice Society” sounded too old fogey. It’s like calling a Ferrari a Volkswagen. It’s only a hair better than “The Super-Friends,” the ’70s kiddie friendly cartoon version of the Justice League. 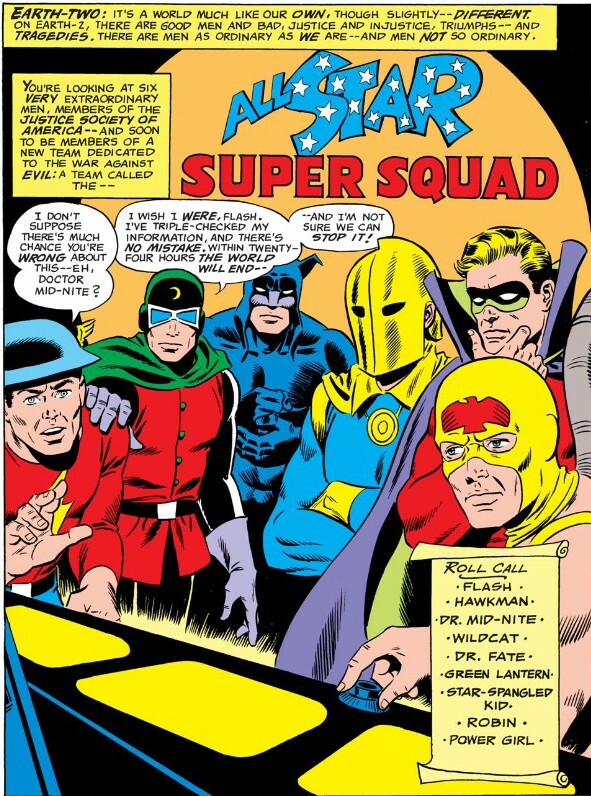 But somebody was also smart to realize that if you just launch a book pushing “the Super Squad,” you risk losing the entire selling point in the first place – the Justice Society. So DC labeled its covers with both names – perhaps the most unusual way to sell a team book ever. Why so serious? Oh, right. The world is ending – again. So call it Super Squad, call it Cole Slaw, the Justice Society of America was back in a big way, headlining its own book for the first time in 25 years. For fans who fed but once a year on the annual team-ups in the pages of “Justice League of America,” this was a feast. The opening two-parter was a delight, filled with terrific action and a level of characterization uncommonly deep for a DC book of its day, all presented by creators at the top of their game. DC practically made the premiere issue irresistible by commissioning Mike Grell to illustrate the cover. I’ve criticized Gerry Conway previously for his scripting – mainly for not resolving a critical story, the murder of the original Mr. Terrific. (Eighteen years really is a long time to wait to see how a story turns out.) But here he presents the Justice Society in a story that feels both retro and monumental at the same time. As “Super Squad” in “All Star Comics “No. 58, cover date January-February 1976, opens, the world is ending. At least, that’s Dr. Midnite’s diagnosis. He informs his fellow members – the Flash, Green Lantern, Dr. Fate, Wildcat and Hawkman – that a mysterious message to the JSA’s computer system relayed the warning that disaster would soon strike three cities – Seattle, Cape Town in South Africa and Peking in China, setting off a chain reaction that will destroy the planet. Six heroes, three perils – why the math demands they split up into smaller teams. It’s a move that pays homage to the great “All Star” classics and leads to some cool action sequences illustrated by the fantastic Wally Wood. When home is twenty years in the past, the commute can be hell. In Seattle, Hawkman and Dr. Midnite run into the Star-Spangled Kid. The Kid had been rescued a few years earlier in the already classic team-up in “Justice League of America” Nos. 100-102. Using Starman’s cosmic rod (Starman gave it to him to use after he broke his leg), the Kid has been fighting crime. But in a poignant aside, the Kid admits to himself that he feels lost in the ’70s. He and his fellow Seven Soldiers of Victory were scattered across the past from the 1950s, and he feels like a man out of his time. The villain monologue: When you absolutely have no henchmen, you have to talk to yourself. Ehh, as far as coincidences go, that’s a big one. And why does he look so … buff? In Cape Town, Dr. Fate and Green Lantern try to save the city from a noxious gas and encounter Robin. Forget that Robin is already a member of the Justice Society. Everyone involved with this story has. Robin also has slimmed down considerably. In his appearances with the JSA during the annual JLA team-ups, he looked as muscular as Superman. Now he’s on par with the Kid. Perhaps he stopped Bat-juicing. In Peking, Wildcat and the Flash race to stop a volcano’s eruption from destroying the city. There’s an exciting sequence in which the Crimson Comet races so fast, he creates trenches in the mountain to contain the lava. But that will only hold for so long. What can they do? Swoosh! The first glimpse of – Power Girl! The mystery flying woman flies in, seals the volcano with her super-strength and then introduces herself to our bewildered Golden Agers. Power Girl introduces herself – and the DCU would never be the same. So Supergirl has an Earth 2 counterpart. This mysterious Power Girl has remained in hiding longer than her Earth 1 double. She’s not all-powerful like Supergirl – she can’t exist in the vacuum of space without protection, as we learn in the next issue – yet she’s far more self-assured. She sports a smart blond bob and a costume that reveals a shocking amount of cleavage for its day. The fact that she’s chosen a name that has no association with her Super cousin demonstrates in an instant that she is determined to carve out her own identity. Power Girl just might be the most confident heroine DC has ever created – and the most important character to emerge out of the 1970s. For reasons never explained, Power Girl knows all about Brainwave’s “disaster game” and suggests the JSA team with the younger heroes – Star-Spangled Kid, Robin and herself – as part of a strike force – the Super Squad! That’s the first and last exclamation point I will ever associate with the Super Squad. The Super Squad vs. Brainwave and Degaton! 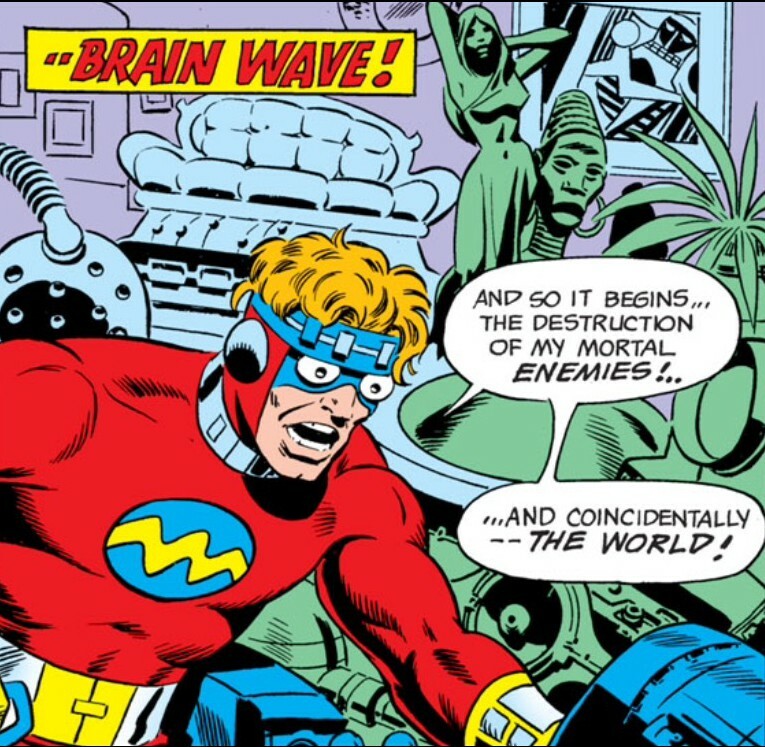 In “Brainwave Blows Up,” “All Star Comics” No. 59, cover date March-April 1976, our villain reveals he has a partner – Degaton! Our heroes smash their way into Brainwave’s space station and brawl with the two villains. Brainwave unleashes a “gravity displacement beam” – one that will send the Earth hurtling away from the sun. With Green Lantern and Dr. Fate bathing her in protective auras so she can survive deep space, Power Girl foils Brainwave by pushing the space station away from the planet. Brainwave’s illusion slips, revealing his true form – still a shrunken toad. 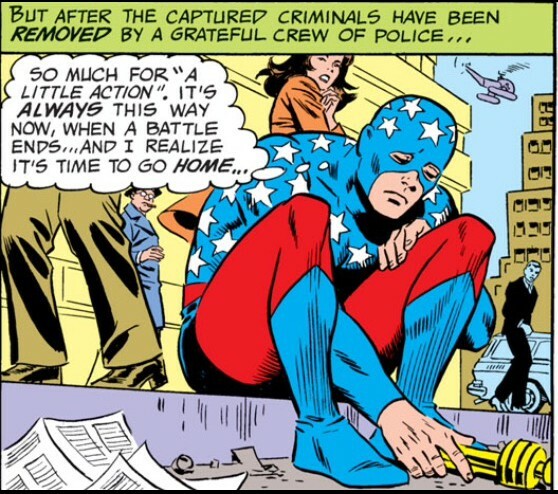 The JSA celebrates its victory by deciding to give this whole crazy Super Squad idea a chance. Power Girl needles Wildcat – a lifetime hobby. Somewhere you just know there has to be a deleted scene in which Wildcat suggests Power Girl act as the team’s secretary, like Wonder Woman did in the 1940s. And you know PG just tossed him into orbit for it. This story is an action-packed classic. But don’t take my word for it. You can read it – again and again – in DC’s trade paperback “Justice Society” Volume One. 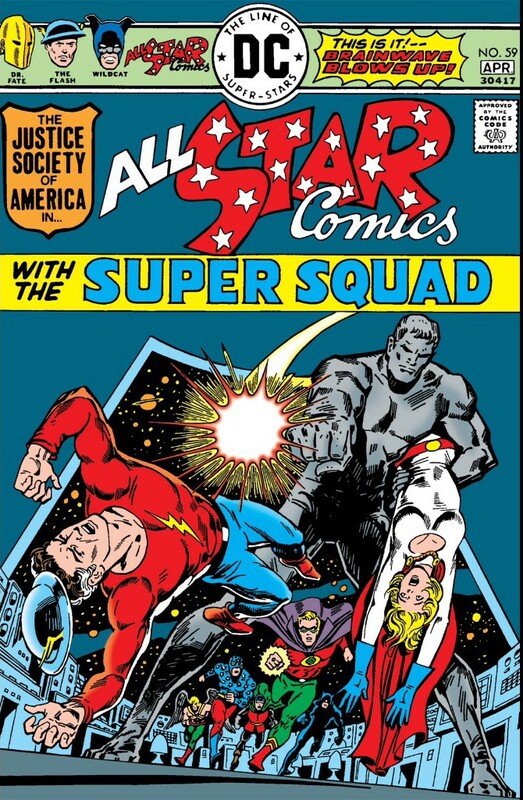 The “Super Squad” logo vanished with “All Star Comics” No. 66. Funny thing about the “Super Squad” premise, though. The basic concept – the JSA teaming with younger heroes, teaching them to be better – became central to the team’s most successful revival and run in the 1990s and early 2000s. Maybe it wasn’t such a dorky team name after all. They Kill Golden Age Greats, Don’t They?